Arbor Day Foundation Trees Pocketknives Illegal In New Jersey? What Makes A Good Padlock? And Should We Care? Having owned a set of large diagonal cutters (and an angle grinder w/cutoff wheels) for a number of years, I’ve always been skeptical when it comes to padlocks. I generally see them as a way to keep mostly-honest (and lazy folks) honest. So when we receive yet another press release for the latest and greatest it’s-really-safe-this-time padlock, we generally don’t get too excited. Are we wrong, though? Do you feel that some locks are truly significantly better at protecting your stuff? The standard padlock comes in laminated, shrouded, and solid-body variants. 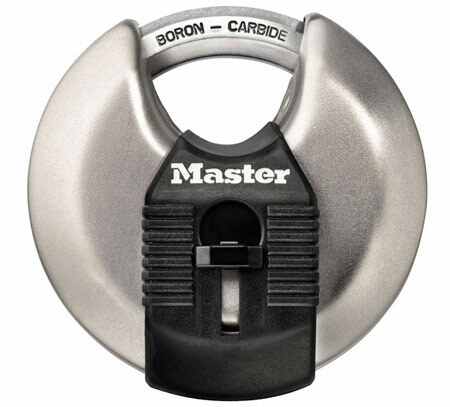 The laminated version is the one you see in the infamous Master Lock “Tough Under Fire” ad, where they claim that their lock survives an encounter with a sharpshooter. Unlike solid-body locks, laminated locks are less prone to cracking under heavy prying because the pry force is distributed among the laminated locks’ many individual plates of steel and the rivets that hold them together. If one plate cracks, the others still contribute structural strength; you have to crack lots of the layers to break the lock. You’ll notice in the video above that the bullet tears a hole clean through the lock, but the lock stays shut because the plates are still held together by many of the rivets. Shrouded models add a case cover that extends above the lock body to make it harder for bastards to slip bolt cutters around the lock’s shackle. Disc padlocks work along this same principal, incorporating a round shape that partially hides the shackle from cutters or pry bars. 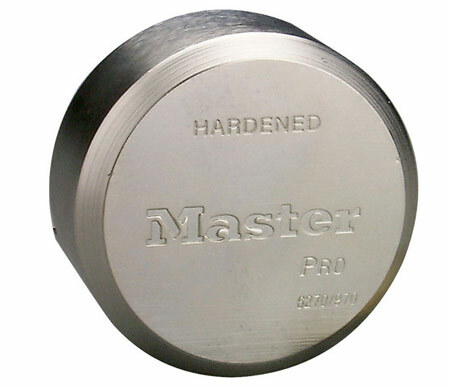 However, most disc padlocks are solid-body, which leaves them pretty open to brute-force smashing. Hidden shackle padlocks take the whole thing a step further, extending the faces of the padlock’s disc to cover the shackle entirely. Next you’ll find all sorts of metallurgy claims, especially in terms of the shackle. And finally you’ll note all sorts of convenience features like stainless keyways to prevent corrosion and so on. So my question: What does all this mean to you in terms of what you buy? How much more are you willing to spend for a quality lock, and what features make the difference for you? Let us know in comments. PS: I’m an OG cheapass, which means I generally just pick up a cheap lock and go for it, though I keep a storage unit at a really great place with cameras and a great crew. I’m asking because I get the feeling that maybe I should pay more attention to my lock selection. 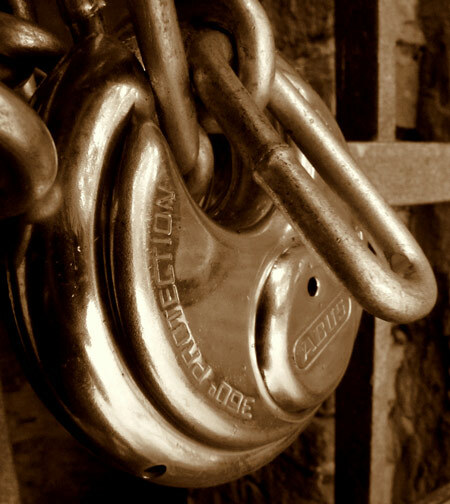 22 Responses to What Makes A Good Padlock? And Should We Care? I have a disc lock on my archery equipment. mostly because it looks cool. the locker is in an unlocked shed surrounded by all my unlocked tools, including extra large bolt cutters, pry bays and 5 angle grinders. So yeah, its pretty pointless. I work for Assa Abloy (The parent company for Yale, Medeco and 300 other lock manufacturers) there are various grades of padlock, and if you are looking to find a padlock that will prevent someone from getting in with bolt cutters or a grinder, you are not going to find that at Home Depot or Lowe’s. Everything that is sold there is “Residential Grade” regardless of what the package says. Basically, you get what you pay for. Caleb even ultra security locks are defeated by any decent grinder. Grinders seem to defeat any lock even $300 pad locks. What is the solution? Well, first you need to consider the whole container. No use for a well defended lock that covers access to the shackle and indeed all of the lock but the keyway, if someone can knock or cut off the hasp or hinges, pry the door, or just bust through a wall. And don’t forget lock picking or many of the common shackle locks can be defeated by slipping a shim down the inside of the shackle to trip the latch. No lock is unbreakable. Ultimately, you want a lock/hasp combo that exposes only the amount of the lock needed to open it normally and a container that is secure from non-lock attacks. And if you need real security, there needs to be human response/rounds at intervals shorter than the time to defeat the lock. Physical access is total access – it’s true of computers and lockers and pretty much anything else. If someone decides that whatever is behind that padlock is worth getting at, then they’ll get at it. I think the deterrent aspect is best. I have a lock on a cheap home depot tool shed. If someone wants in, they could probably kick the doors off the hinges and the lock would remain intact. I agree with Caleb, if someone is determined they will defeat the integrity of the storage unit via the lock or the unit itself. That said I go for intimidation. I use a HUGE master lock I bought years ago. jkb summed it up well. locks only make access inconvenient (hopefully more so for unauthorized persons) and notify folks that they’re not supposed to be there. if someone wants in, they’ll get in, by prying cutting picking bumping or otherwise exploiting a weakness in the security. even government safes aren’t designed to be unopenable, they’re designed to resist opening for so long. the nicer the lock, the more thieves will think is in there, but too cheap a lock and they’ll open it with a hammer to see. as a rule, expose the least amount of shackle you can, and buy a lock that is of decent enough quality that it won’t seize up with a bit of dust when you don’t open it for a few months, or cheap enough that you don’t mind popping it off with bolt cutters when you loose the key, or it is frozen. That first picture is a fine example of a waste of money. That nice expensive lock on a chain that would take all of a second to bust with a standard set of bolt cutters. What you are attaching the lock to, is probably more important than the quality of the lock (within reason). I agree with Aaron…I’ve seen all sorts of locks from cheap to super expensive on the storage units my old employer used. Each one of them was locked to 14ga steel flanges that looked like they could be cut with a few hatchet whacks. Just hope you don’t have this guy trying to break into any of your stuff. Last I checked, there were few, if any, locks he couldn’t bypass while leaving no evidence. Including the ultra high end Medeco locks that the US government uses for their top secret stuff. Even the best locks can be defeated by mediocre crooks. I do recall an episode of Mythbusters where they were shooting locks with various caliber weapons. They shot padlocks as well as a deadbolt. Very interesting results. But – – they commented on the same thing we all know: you don’t have to defeat the lock to gain entry. We kind of laugh at some big locks put on construction trailers that have thin aluminum or even vinyl skins – the door and lock may be somewhat secure – but the rest of the box is not. Our E-350’s are all fitted with hidden shackle locks – but would not think that they would survive long if we parked overnight in some of the areas in which we do our daywork. Most of the security measures just slow crooks down a wee bit. For most home owners, even plastic padlocks are often fine simply because it’s the terms of your insurance you will be relying on. (IE: My shed and hot tub came supplied with plastic handles, clasps, and the cheapest plastic locks. Any use of non-approved locks or any attempts to modify (install metal handles) would invalidate my insurance coverage. As I found out, in terms of insurance, the policy holder’s definition of “upgraded” can be debatable, leading to non-payment. Stock condition cannot even if it seems horribly insecure. If you have a cabin out in the woods though, you’ll need the best lock you can find, as insurance will never cover your contents. I think all the commenters here have the right idea. Locks only serve to keep honest people honest and simply slow down the dishonest. You are kidding yourself if you think any lock will keep a determined thieve out. Good to see a few people mention that the lock is only one piece of a system of protection. Any reasonably intelligent burglar looks for the weak link and exploits it. I am glad to see nobody here recommended resorting to guns and dogs. It seems like anytime security is concerned one or both of those is mentioned without regard to the legal implications that often follow using either. Not to mention you have to actually be there at the ready to use a gun. My favorite methods are to not leave anything visible if possible; I pack out most of my tools every night then lock down the rest in inconspicuous places. Then don’t look flashy but don’t be too trashy; you want to look a little poor or blend in. A brand new job box or worse a big trailer spray painted “TOOL CRIB” gives thieves direction whereas a repurposed u-haul could be a crapshoot to a cretin. Last is to put a light on it. Best to use motion lights since people can become immune to constant (mercury) lighting but will more often become at least a little more alert to see a motion light flick on. In civilized country – lock serves as a deterreant and should be tamper evident – the potential loss is covered by insurance. If you are in combat zone then it is different deal. I’d go for a well-made disc lock or the shrouded model, as long as the entire shackle was taken up by whatever it’s locked with or to. After that, it’s all about the mechanism and if it’s pickable. There are plenty of ways to defeat a basic lock, but any decent setup that would take several minutes to defeat will usually deter most common theives, at least in an area that isn’t totally deserted for long periods of time. Other than that, a layered approach works best. If you really want to protect something, have more than one layer needed to be defeated to get in. A bolted down and locked jobsite box inside a locked cargo trailer really makes a thief work for whatever they think is worth getting in there. As mentioned, it’s more about deterrence anyway, and so something with a mean enough lock has a good chance of discouraging a thief, sending them searching for an easier target. I worked for a company that managed four mini storage facilities for about five years. Needless to say, I’ve broken into just about any padlock you can find. 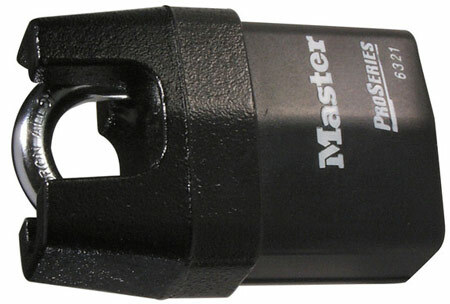 The disks and hidden shanks are both fairly resistant to bolt cutters and prybars, particularly the octagonal shackle masterlock pictured above. Ultimately, however, anything with an exposed key slot is vulnerable to 30 seconds worth of drilling. cheap standard padlock – hammer, large screwdriver, pipe wrench, etc. While this may seem discouraging at first, most higher end locks will do a decent enough job. In general, crimes are based on someone seeing a chance for easy money. Unless they really want your stuff, or happen to have power tools on hand, there isn’t that much to worry about. For the record, 90% of our break ins involved kicking in the roll up door next to the track. I am entirely aware of the probblems with padlocks and virtually any other security system. They only really stop opporitunist thieves. For me, security is all about disguising your valuables, keeping them out of sight, or watching them like a hawk. The city farm where I work has lost hundreds (if not thousands) of pounds through the theft of cameras, power tools, and cash boxes. When I use a drill, I don’t put it down untill it is hidden. Abloy protec locks can’t be picked. You got to ask yourself, if they are illegal how much noise attraction do they want? Yes you can blow a lock off, and drill etc, but the noise is something. As for bolt croppers, there is a limit to how large they can crop, anything with a 1.5 cm shackle, be fun to watch them try. So for a shed, I would use an £80 abloy. The Finnish make cool locks. I agree with frank abloy locks are fantastic I have just ordered a abloy PL362 there top padlock and it is unpick able slege hammer,grinder,saw proof just to mention a few things I think you have to make as hard as possible for thieves to get into but you have to look at the weakest link, is the shackle strong enough if not they will go for that, you have to try to think what you would do to get in and then fix the potential week link,They want quick access,Leave lights on in your house install an alarm it all helps,if you spend 100 pound on a lock to protect 2000 pounds worth of stuff it’s money well spent to me. There are locks that emit a 110 dB alarm if they’re molested in any way. No thief can stand being next to an alarm going off. Next, Abloy locks are some of the very best. I have a Model 358 with a 14 mm shackle. It can probably be ground open in ten minutes or so. But it has never been picked or bumped. I don’t use it; I have it for its mechanical beauty. It is a work of art. The Finns really know padlocks. I would recommend an alarm along with the padlock. Noise is an effective deterrent just by itself. In my house I have a big Liberty safe. But I kept looking at it, thinking that if someone broke in and wanted to rob me, they would know that’s where the good stuff is. With a knife at my throat I’d probably open it for them. So I recently installed a hidden floor safe, buried in 3 feet of rebar-reinforced concrete. It’s wired to my house alarm system. That’s where the REALLY good stuff is. They can have my stamp collection from the big safe. Security is all about out-thinking the crooks. A good lock, a good alarm (and video surveillance if possible; if not, fake cameras and warning signs are worth the small cost), and deception regarding your valuables will probably cover you. Along with insurance coverage, of course (but insurance for jewelery is very costly). Finally, for a really intimidating-looking padlock, check out the ABUS 83/80. Just looking at that giant padlock will probably discourage amateur thieves. With an Abloy cylinder, it’s about the best protection you can get with a padlock. Finally, a word about security chains: a case-hardened chain is very hard to cut with bolt cutters. It can be cut, though. But case hardening only hardens the outer few thousandths of an inch. A heat-treated chain is much better (and more expensive). A half-inch heat treated chain link simply cannot be cut with 42-inch bolt cutters, and it would take a while to grind through it. Yep and you bought all that too, I’m sure. Say I’m missing a grinder. Got a four wheel drive in there with all that junk? Glad you put your two cents in now we know where all our stuff is.